Because Arash Farhadi already had a degree from another university, he was deemed to be an Equivalent Level Qualification (ELQ) student. This meant that he was not eligible for any government benefits when he enrolled on our BEng Petroleum Engineering course. Arash was so determined to study at LSBU, however, that he was prepared to fund himself for three years. "It meant I had to work hard in order to fund my studies," he recalls. "I worked full-time in hotels to support myself. Sometimes, I would leave work and head straight into a lecture! It could be tiring, but I enjoyed my course and life at university so much that it was easy to keep my motivation levels high. I am a natural self-motivator anyway, and am determined to always do my best in everything." Despite having to work hard outside his classes, Arash still stood out academically. "I managed to secure three internships in three years, something that no-one else on my course managed to do," he says. "Gaining the internships was something that my lecturers and friends were very proud of me for." 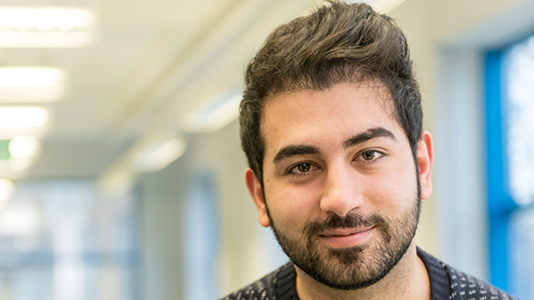 Arash had enjoyed his LSBU experience so much that he was eager to continue to Masters level, so he enrolled on our MSc Petroleum Engineering. To fund his continued learning, he considered applying for loans or continuing to work full-time while studying, but these were not options he was keen on. "I wanted to give as much as I could to my studies," he says. "I didn't want to have to worry about repayments or have to sacrifice time I could have spent researching my subject. So I applied for a Vice-Chancellor's Scholarship. I knew that competition would be tough, but I was hopeful that I would succeed." Arash's application was successful, and he describes the award of £4,000 as "life-changing" and "one of the most amazing moments of my life." Thanks to the scholarship he was able to enrol on to his chosen course. During the course I probably enjoyed lab work the most, the experiments and also using the computer simulation software. It's great the course isn't all theory and you get to practice applying knowledge – something that's expected of you once you enter the industry. Arash has now graduated and is currently working as a Reservoir Engineer for an oil and gas consultancy firm. He is involved in developing simulation models to predict oil reservoir performance to determine optional production techniques to maximise profits and reduce risks. "My company are developing me quickly – I'm being trained to work across Europe. I think my internships during my time at LSBU definitely helped, and I would recommend doing one to anyone looking to work in this sector. The time I spent developing my IT skills and software techniques really helped too - it's something you have to know at this level." LSBU awards up to £48,000 in Vice-Chancellor's Scholarships and bursaries to postgraduate students each year. They are made possible by donations to our Annual Fund from alumni and other supporters. Visit Vice-Chancellor's Scholarships.